Findings of the interdisciplinary research conducted under the UK NEA Follow-on Phase were released today at an event hosted by the Living With Environmental Change. The event combines the launch of the Follow-on publications with a workshop, facilitated by the Ecosystems Knowledge Network, on sharing experiences of implementing the ecosystem approach. 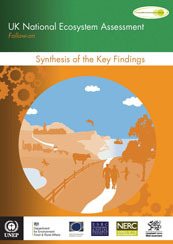 The Synthesis and Technical reports of the UK NEA Follow-on can be downloaded from here. The BESS (Biodiversity and Ecosystem Services Sustainability) programme is a 6-year, £13 million research programme addressing NERC strategic challenges and societal needs and the UK Government’s strategic priorities with respect to biodiversity, ecosystems and their services. This funding call is for workshops which contribute to the goals of the BESS programme, with an indicative cost of up to £8000 per workshop or series of workshops. LWEC has published an article on how the UK NEA is continuing to generate international interest and is proving influential in the way other nations approach their own assessments. Environment Secretary Caroline Spelman spoke of the UK NEA follow-up phase in her speech at the Planet Under Pressure conference in London. What is the UK National Ecosystem Assessment? The UK National Ecosystem Assessment (UK NEA) was the first analysis of the UK’s natural environment in terms of the benefits it provides to society and continuing economic prosperity. Part of the Living With Environmental Change (LWEC) initiative, the UK NEA commenced in mid-2009 and reported in June 2011. It was an inclusive process involving many government, academic, NGO and private sector institutions. The NEAFO community would like to extend its deepest sympathy to the family and close colleagues at SAMS of Laurence Mee, following his sudden death on 13th of August 2014. Laurence was a significant contributor to the NEAFO and he will be greatly missed by all of us. Laurence was an excellent marine scientist but also a very active contributor to the coastal and marine policy process. His boundless energy and enthusiasm was applied across a whole range of issues with policy relevance being the key feature. He was also a very effective communicator and used this skill to good purpose around the globe in numerous academic and governance circles. On a personal level his warm hearted nature touched everyone he came into contact with. Laurence’s passing will leave a big gap in the marine science and policy field and amongst his many academic colleagues who were also his friends. His memory will live long with all of us who were privileged to know and work with him of the years. Kerry Turner, Bob Watson and Steve Albon, NEAFO Co-chairs, on behalf of the whole NEAFO network.